As Jacques Cousteau said, “people protect what they love.” But before you can love something you need to know it, and there’s no better way to learn than through total immersion within the blue universe we’re fighting to preserve and protect. This belief guides the curriculum of Parley Ocean School, a unique program blending ocean activism with learning and exploration on, around, and in the marine environment. Through a series of global marine expeditions, Parley Ocean School (POS) aims to educate and empower a new class of ambassadors for the movement. Each session is dedicated to deepening scientific understanding of marine cultures and environments, with a focus on promoting stewardship, awareness, and solutions in local communities. Every POS alumni leaves with a renewed understanding of their role in this world, and of the actions they can take to protect it in the office, by the sea and at home. In November 2015, we held the first Parley Ocean School session in the Maldives, where we’re working with local authorities and the nonprofit organization B.E.A.M. to implement the Parley AIR strategy and provide community education and infrastructure to help prevent, divert and reduce plastic pollution in the Indian Ocean. November 17-24, a group of 20 adidas employees traded their offices in Germany for a week aboard a POS expedition vessel, joining a crew of advocates, filmmakers and scientists from the Parley network to learn about, explore and protect the marine habitats of the Maldivian atolls. Through a series of Parley Talks and workshops led by Parley Ocean Ambassadors (a crew of experts and activists from a range of marine fields), adidas employees learned about the dire state of the oceans and the steps we can all take to improve it. POS lessons included direct action and cleanups on remote islands, experiential learning in the field (e.g., paddle boarding, surfing, snorkeling and diving), and community engagement. In collaboration with B.E.A.M., the adidas x Parley crew supported initiatives to educate and empower island communities so they may better respond to the human-driven threats of a changing planet. Highlights included swimming and snorkeling lessons for the local youth, a warm reception on Kondey Island and a football match with the local community. Like every Parley project and event, POS brought together a diverse group of people and ideas for a greater cause, namely, the protection and preservation of our oceans. Launching this Parley initiative in the Maldives helped a class of 20 adidas employees more clearly understand marine ecosystems and what we stand to lose should we continue on the present path of destruction. More importantly, it helped a group of talented individuals gain a deeper, personal connection to the unique environmental, social and cultural impacts of these global threats. The aim of POS is not only to provide the tools for creating positive change, but to inspire individuals to use them in their everyday professional and personal lives. We all have a role to play in the solution. POS is our way of educating and empowering today’s — and tomorrow’s — ocean leaders so they can discover, define and apply theirs. Thank you to everyone who helped make the first Parley Ocean School a success! Read product designer Jasmine Bynoe’s POS recap and learnings on the adidas Group blog. 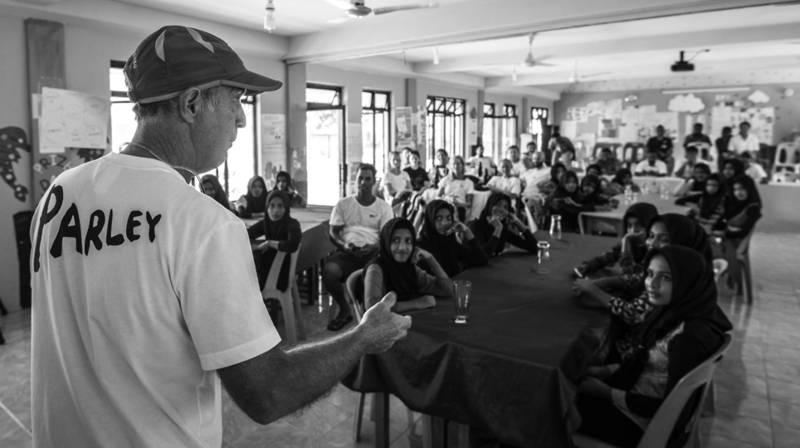 Read Parley Ambassador Iain Kerr’s reports from the atolls on the Ocean Alliance blog.